Happy Birthday, Dad — this tart’s for you! I know how much you love strawberry shortcake, so I wanted to put a spin on it for your special day. This springtime tart is a tempting combination of shortbread-like crust with a lightly sweetened, vanilla-scented whipped cream and mascarpone filling, all topped with a mound of barely balsamic-y strawberries. I hope you like it! Whisk together sugar through salt in the bowl of a stand mixer, sprinkle in butter pieces. Fit stand mixer with paddle attachment and mix until the butter and flour mixture resembles peas. Add egg and water; mix until the dough just begins to form. If the dough has gotten too warm at this point, form it into a thick disk, wrap tightly with plastic wrap and refrigerate for 15 minutes until firmed up but still pliable enough to roll. Lightly flour work surface with flour and roll the dough into a 12″ circle. Fit the dough into a 9 1/2″ fluted tart pan with a removable bottom; make sure there aren’t any air bubbles or cracks. Fold the excess dough back into the pan so that the sides of the tart are now about double the thickness of the bottom. Neatly trim away excess dough around the top of the pan. Freeze for a minimum of 1 hour (up to 3 months) before proceeding. Preheat the oven to 375°F. Remove tart from freezer and place on a large, rimmed baking sheet. 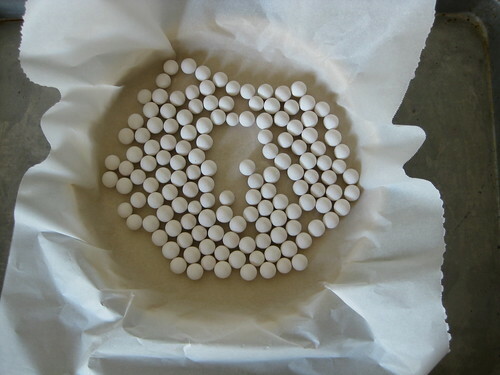 Place a sheet of parchment paper over tart and fill with ceramic pie weights (see this photo for clarification, if needed). Place tart (baking sheet and all) on the center rack of the preheated oven. Bake for 25 minutes; carefully remove pie weights (I usually do this by gathering the four corners of the square of parchment, making a little sack). Bake for another 5-10 minutes, or until lightly browned (7 minutes was the magic number for me). Remove from oven and cool completely in the tart pan before filling (about 1 hour). Wash strawberries really well in several changes of cold water. Dry using a salad spinner or by patting dry with a clean towel. Pinch off strawberry stems. Using a paring knife, hull strawberries. Slice lengthwise into quarters from stem end to bottom (halve really small berries). Place in a large bowl. In a small dish, whisk together balsamic vinegar and 1 teaspoon powdered sugar just until dissolved. Pour vinegar mixture over strawberries, toss gently to coat. Allow this mixture to sit at room temperature for 15 minutes, toss every few minutes during this time. While strawberries are macerating, make filling. In a stand mixer fitted with the whisk attachment, combine mascarpone cheese, vanilla extract and 1/4 cup powdered sugar. Whip on medium speed for 30 seconds-1 minute or until lightened, do not over beat. Scrape down bowl and beater; add heavy cream. Start beating on low speed, gradually increase to medium as the mixture thickens. Beat just until firm peaks form (about 1-2 minutes), be careful not to over whip. 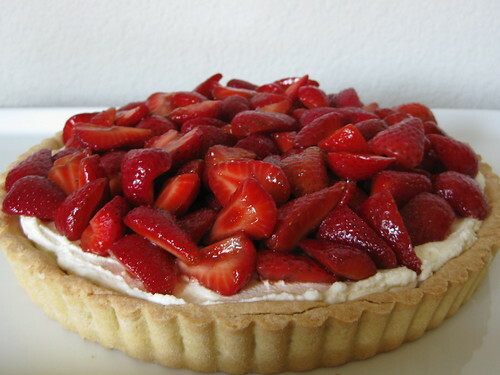 If desired, add more sugar to taste (keep in mind the tart shell and berries will both contribute to sweetness). Spread filling in cooled tart shell. Stir berries one last time, drain in a colander (don’t rinse); add more powdered sugar to taste, if needed. Pour or spoon berries over filling. Serve immediately, or chill, covered, in the fridge (remove from fridge about 15-30 minutes before serving to take some of the chill off). ¹ I used Lucini Balsamic Vinegar of Modena, 6% Acidity. It’s a bit sweeter than some other brands I’ve tried, and was on sale for $10/bottle at Whole Foods (not cheap, but certainly not even close to how pricy balsamic vinegar can get). Feel free to use any Balsamic you like, though. Additional powdered sugar can be added to balance out any overwhelming tang. I have never tried using balsamic on strawberries but it is probably a good pairing with the marscarpone. I will need to try this method when preparing fruit. The picture is awesome-thanks for sharing. This tart has my name all over it… the tart shell sounds super interesting! Tina: I was shocked by just how good it is, really brings out the natural sweetness of the berries. Thanks for stopping by and commenting! Tiffany: I hope you try it out, it’s my go-to tart shell recipe. Never fails, never tough, always tasty!